At the end of long deliberation at the Supreme Court in Jerusalem, the court suggested the holding of a conciliation process in order to reach a fair solution on the question of Bedouin land ownership at al-Araqib, northwest of Beersheba. The judges expressed their displeasure with the extremely long delay in dealing with claims filed by the Bedouins over fifty years ago, and suggested that negotiations be conducted for six months between the al-Ukbi tribes people the state authorities, in order to achieve “a fair solution. Attorney Michael Sfard, representing the al-Ukbis, proposed to establish a process of conciliation. The judges were favorably inclined to this proposal, but state representatives sought a month`s extension before answering. Ultimately, the court ruled that the state must present its position regarding conciliation within two weeks. The judges, led by Elyakim Rubinstein along with Esther Hayut and Salim Jubran, showed a clear tendency to bring about a mutually-agreed compromise, rather than either endorse or reject the ruling of Judge Sarah Dovrat of the Be`er Sheva District Court, who had ruled against the Ukbis and completely rejected their ownership claim. The Judges’ tendency to promote negotiations, as well as their support for the conciliation idea proposed by the Ukbis’ counsel, suggest that the judges regard the issue as complex, many-faceted, not to be considered by purely judicial criteria; such consideration might justify rethinking what is due to the Bedouins, and move away from the tight-fisted policies hitherto implemented by the Israel Lands Administration. It should be noted that in previous cases where negotiations were conducted between the state authorities and Bedouin residents of the Negev, the proposals offered by the state consisted of no more than monetary compensations (usually low) and in rare cases a small piece of land (but not the original land from which the Bedouin had been dispossessed , but land in another location determined arbitrarily by the state). It would be difficult to define any such proposals as a “Fair Solution. Members of the al-Ukbi Tribe had been expelled in 1951 from their homes and lands at al-Araqib, by the military government at the time ruling over the Arab citizens of Israel. Simultaneously with the expulsion, the then Government of Israel unilaterally expropriated the land and declared it to be state property, without even bothering to inform the previous owners of having taken that course. Nuri al-Ukbi, a veteran Bedouin rights activist who is one of the appellants, said: With the injustice done to us in 1951 never being redressed, we hope and expect to find justice at the Supreme Court. The way the court’s deliberations were going seems positive, and we accepted the court’s proposal for conciliation. In that way, we can present all the facts which substantiate our case. At the very least I hope we would be able to establish our residence on the site of our family home in al-Araqib, the house that served the State of Israel as a polling station in the first Knesset elections in 1949, and where a Tribal Court was active with accreditation from the State of Israel, with the national flag and state emblem displayed when it was sitting. Such a measure would ameliorate our pain, and it would be to the benefit of the state as well to solve the problem of 400 people and provide them with shelter. It would be a proof that redressing injustice is possible even after the passage of many years, an injustice which the state authorities caused us without the slightest shred of justification. During the court deliberations, historical and judicial issues were raised far beyond the specific case of the Araqib lands. The parties discussed the judicial status of the Negev lands under the Ottoman Empire and the British Mandate and the situation on the ground in the Negev during those periods, as all those issues carry weighty implications for the present status of the lands and of ownership over them. Comparisons were also made to similar situations in other countries, such as Australia`s attitudes to the Aborigines. Prof. Oren Yiftachel of Ben Gurion University, who had given an expert testimony at the original hearing in the District Court, said: After years of enormous effort in research we obtained—through archives, aerial photos and the testimonies of tribes people—solid evidence backing the land rights of Bedouins in the northern Negev. This is the first time that such materials are presented at the Supreme Court. 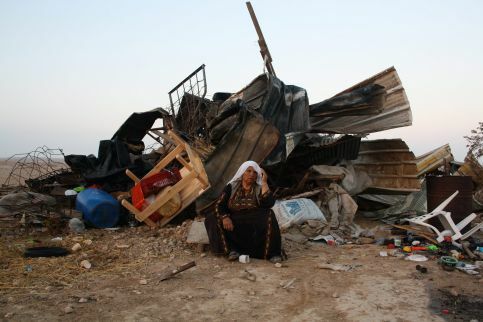 Though there is as yet no ruling, I hope that presentation of these materials would in itself make it clear to the judges that sixty years of Bedouin dispossession in general—and the Ukbis’ dispossession in particular—were based on a judicial and historical falsehood. A conciliation process might lead to a reasonable outcome, and we will continue as much as possible to help the Bedouins assert their rights.